Pinyon jays and New Mexico go together like peanut butter and jelly. Or, in this particular case, more like piñon pines and their seeds. These long-billed, sky-blue jays are found in piñon-juniper habitats throughout the west, including New Mexico. In fact, it is estimated nearly one-third of the world’s pinyon jay population resides within New Mexico’s borders. This seems more impressive considering the highly social nature of this bird. They occur in large flocks that may contain more than 500 individuals and are rarely seen alone. Many jays remain in their birth flocks for the duration of their lives and flocks nest in large colonies, usually in the same general location year-after-year. As suggested earlier, the pinyon jay has a close relationship with the piñon pine tree and its seed. This relationship is critical to both for survival: For the jay it’s a means of sustenance and for the tree, it is dependent on the jay to spread its seeds. The pinyon jay specializes in collecting, transporting, and caching the seeds. 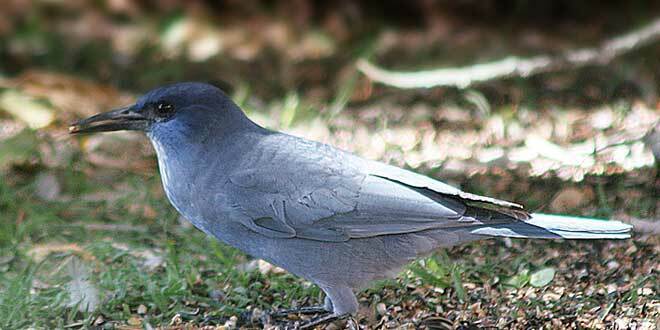 In a good year, one pinyon jay may store in the ground approximately 2,600 pine seeds. As members of the same family as crows and ravens, which are known for their intelligence, pinyon jays are among the smartest of birds. Individual jays can remember where they cached approximately 95 percent of their piñon seeds and, even after several months have passed, they can remember thousands of locations even if the spots are under snow. In addition, given their monogamous nature, members of a pinyon jay couple ensure they know where their partner’s seed stash is hidden — a bird version of a life insurance policy. The relationship with the piñon pine comes from the 5 percent the jay forgets in the ground, effectively planting new piñon pine forests. The relationship is so intertwined that one cannot survive without the other. The news isn’t all good for this brightly-colored bird or the pine. While New Mexico remains a haven for the pinyon jay, these birds are not doing particularly well. Since the 1960s, it is estimated that pinyon jay populations throughout the west have declined by more than 80 percent, making their population among the fastest declining of the western forest bird species. The reasons are varied, including the past clearing of piñon-juniper woodlands and die-offs of piñon pine due to drought and bark beetle attacks. Researchers are also looking at the potential impacts of climate change. These factors have left the pinyon jay with an uncertain future and, as a result, has been listed by the New Mexico Department of Game and Fish as a Species of Greatest Conservation Need. The department is working with a variety of partners to protect and improve pinyon jay habitat so future generations of New Mexicans may continue to enjoy this smart and social bird while ensuring the continued seeding of piñon pines throughout its range. Left: Pinyon jays can remember, months later, and even under snow, the locations where they have stored piñon pine seeds. The few locations that are forgotten promotes new growth. The relationship between the tree and the bird is critical to the survival of both. Photo by Mark Watson. Editor’s note: While most New Mexicans are familiar with the spelling, “piñon,” when referring to the jay, the tree or the nut, the American Ornithologists’ Union, the organization responsible for standardizing common and scientific bird names, prefers “pinyon” as the official common name of the jay. Peggy Darr is the Department of Game and Fish nongame avian biologist at headquarters in Santa Fe.